Since I am so loyal to Josie at @nailsmakeupme and will not go to anyone else for a mani or pedi, it means that sometimes I can't have my gelish done as often as I'd like, so after being recommended Dr Lewinns (post to come in a few weeks once trialled) renunail, I am getting excited about my nails becoming less paperlike, and being able to paint them myself more often. So at last I can get excited about pretty new colours for the new season, and just looking at the colours of the new Dior Cherie Bow Collection sends me into a bit of a frenzy...I'm not sure whether it is because the pinks remind me of marshmallows and I am desperately trying to not cave and eat rubbish, or just that the dusky yet clean colours remind me of pretty and graceful ballerinas. The colours are Tutu, Rosy Bow and Gris Trianon and by all accounts they have pearly particles in to give an incredible shine and sparkly. Just re-reading what I have written makes me so desperate to try them! 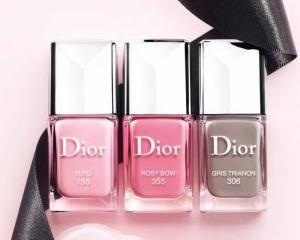 I am quite keen on getting all 3 and experimenting with a twist on a French manicure, I have never had a French Manicure in my life, as they are just not me, Dior what are you doing to me? Have you tried any of these colours yet? It's really tempted me Jenny!